This article describes the installation of a web server (Apache Tomcat) and the deployment of the innolist.war (Download) using Microsoft Windows as operating system. For other web servers or operation system the deployment should work similar, for details please see the installation/configuration manual of the web server used. We suggest a 64-bit distribution, in this description "64-bit Windows zip" is used. The port configuration is not mandatory, there are already default ports configured in the configuration file conf/server.xml. 8009 - "AJP Connector port"
The ports must not be used by other programs. The port 8080 is used by default to connect using a browser (for productive environments maybe port 80). Note: If the file name (here: innolist.war) differs, the deployment will only be reachable with this changed url path. If necessary the directory for configuration/data may be changed in the configuration file system.xml. 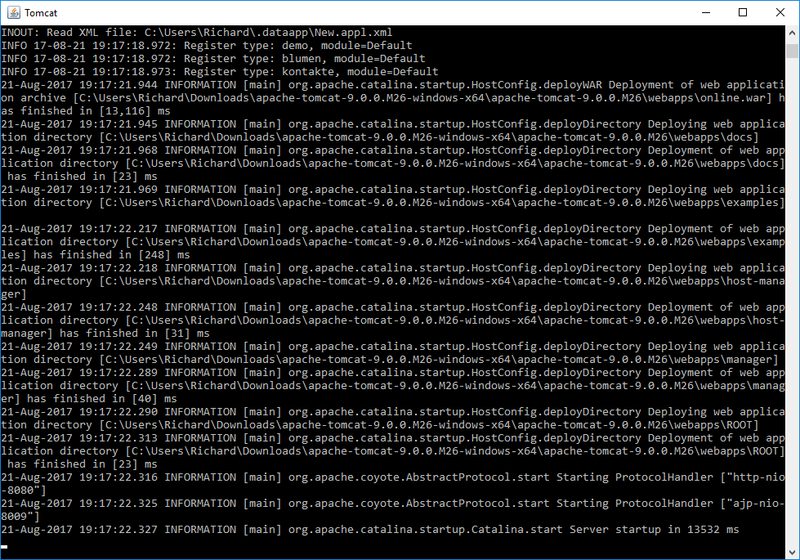 Windows: By executing bin/startup.bat Apache Tomcat is started. The console window for the instance of tomcat is shown. visible in the output then the starting was successful. The application is then reachable over http://localhost:8080/innolist/ . Windows: By pressing Ctrl + c in the console window Apache Tomcat is shut down. With a restart of the server (and if necessary clearing of the browser cache) the icon is visible in the browser.